Strategically located in Frankfurt's banking district, these offices offer an ideal working environment for successful companies. They are provided with a full range of facilities, including fitness centre, terrace, on-site café and the latest technology systems. In addition, there is IT support for the shared internet provided, as well as administrative support, conference facilities, and reception services. This great centre is situated in the centre of Frankfurts central Westend district, with excellent transport links close-by. The centre provides a range of office spaces that offer inspiring, efficient and flexible business solutions to suit your specific needs. The centre also benefits from a roof terrace where you can socialise with likeminded colleagues within an attractive, well-designed space. 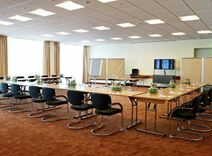 Located in a key area of Frankfurt the space comes full furnished with access to a full equipped conference room. For efficient communication, the centre comes with telecoms. Surrounding areas also offer many local amenities and eateries. Close by, there are lots of museums, performing arts theatres and historical monuments to explore. In addition, you can take advantage of the space's 24 hour access so you can work through late hours for however long you require. 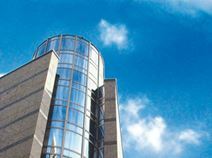 A selection of office spaces is available in a renowned business area of Frankfurt. These offices are provided with a wide range of services and facilities. In addition, there is also shared internet to keep you well connected, and telecoms for efficient communication. Centrally located and excellently served, they benefit from this exclusive business address, which will definitely enhance the image of your business. An impressive business hub situated in central Frankfurt, offering furnished offices on flexible terms. Tenants can make use of the high-speed internet, communal areas, reception desk, 24-hour access and spacious meeting rooms. The work-spaces benefit from plenty of natural light as well. The local area is renowned for its eclectic mix of stylish bars and restaurants, a perfect place for networking with like-minded professionals or hosting client visits. 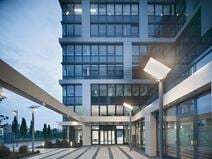 Conveniently located in the attractive banking district of Frankfurt, this stylish building offers modern office solutions, provided with air-conditioning and parking facilities and is supported by a professional and friendly staff assisting your business with high quality services. Surrounded by numerous restaurants and shops, it is well connected to various cultural attractions and it is located within walking distance of the main railway station. This landmark building offers stylish offices sophisticatedly designed and equipped with state-of-the-art technology. Furnished to a high standard, this building offers ideal office solution and a highly professional working environment. Close to the centre of Frankfurt, this building is surrounded by banks, hotels and numerous restaurants and cafés. It is well connected to the airport, served by numerous public transport routes and situated within walking distance of the main railway station. Stylish offices are available to let in the attractive banking district of Frankfurt, surrounded by leading companies and a variety of amenities: restaurants, hotels, shops and cultural attractions. This strategic location will enhance the image of your company. The offices are provided are sophisticatedly decorated and provided with an elegant reception area, parking facilities and a full range of other facilities. They benefit from excellent connections to the airport and various public transport links. This modern business centre is located in the Opera Tower, which stands at an impressive 170 metres with a stunning natural stone facade. Here you have a selection of interior/exterior offices, office suites with combined meeting rooms and coworking spaces. High speed internet and telephone lines keep you connected, along with video conferencing facilities for your convenience. MyZeil shopping centre can be found within walking distance, which offers a range of leisure activities. This modern business centre is spread across four floor of an impressive building with a glass, stone and metal facade. The centre boasts a beautiful reception, offering a range of workspaces including fully serviced offices, coworking spaces and virtual office options. Meeting rooms are at your disposal and ready to use, with all the equipment you may need during your working day. Found in the westend of the city, the centre has excellent transport links with the Alter Oper train station just a few minutes away. Opening soon in the city centre of Frankfurt, this business centre is strategically placed with plenty of amenities to benefit from in the surrounding neighbourhood. Offering a range of modern and spacious workstations, offices are filled with plenty of natural light and provide a professional, productive and comfortable space to work. 24 hour access to the facility allows you to work around the clock; whenever suits you. The main train station is only a 14-minute walk away, with major tram lines also passing through the area. There is options of fully equipped individual and team offices, starting at 12 m². In addition, you can take advantage of this centre's virtual office options, allowing you to be as versatile as the demands of this digital age. The building is accessible 24/7 and you will be supported by an on-site admin team who can help you with telephone answering and mail handling. Just a short drive away, there are several hotels and a shopping centre. 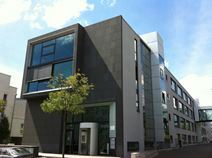 Located in Westside Frankfurt this business centre is found in the district of Roedelheim. Offering a range of excellent amenities and facilities, offices come beautifully furnished and ready to use. There is a selection of coworking spaces in a collaborative setting, with 2 bespoke packages: flek and pro tariff. You will have access to beverages courtesy of the business centre, including tea, coffee and water. Printers are also readily available to use, and you will have 24/7 access so you can work whenever you want. Communal areas in the centre include a kitchen and lounge area where you can relax. Located just outside of the city centre this is a highly desirable location, with easy access to the city centre. 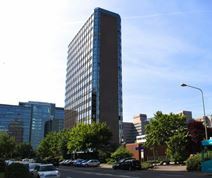 Set in a popular area, close to major transport links as well as a great range of restaurants, bars, shops and banks, this serviced office center is located in one of the highest buildings in the country. With stunning views, this impressive address is ideal for your business needs. Here, you can take advantage of its accommodating facilities, such as 24 hour access, multilingual staff, copy and printing facilities and even company signage. 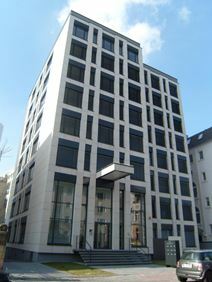 A selection of offices of various sizes is available to let in the western part of Frankfurt. Within walking distance of the main railway station, this area is excellently served by public transport and hosts numerous hotels, restaurants and companies. These offices are provided with a full range of services and facilities, including spacious meeting rooms, advanced videoconferencing facilities and first-class telephone and reception services offered by a professional and skilled support staff. This centre benefits from an abundance of transport links with lots of local amenities within reach. There is a wonderful view from the offices, and the space offers a modern interior which will keep you motivated. This 24-hour space offers conference facilities and a co-working cafe, with an atmosphere that encourages collaboration. Close by, you can find the Alte Oper concert hall, the Rothschild Park and the Grüneburg Park between the Palm Garden and Botanical Garden. Located in the heart of Frankfurt's business district, this business centre boasts a variety of flexible workspaces ranging from private offices and collaborative coworking spaces, to meeting rooms and virtual office options. In the neighbourhood you will find a range of international companies with whom you can network, including Nintendo. Work stations benefit from excellent facilities including access to an on-site canteen, high speed Wi-Fi, telephone connectivity and stunning views of the city. Meeting rooms are easily booked out on an hourly or daily basis. The centre also benefits from excellent public transport links with the train station only a short walk away, and easy access to two major motorways. 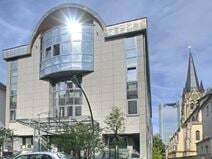 Offices of various size and large meeting rooms are available to let in this impressive building located in a dynamic business area of Frankfurt. Provided with the latest technology, advanced videoconferencing facilities and parking facilities, it offers secretary and telephone services. It is surrounded by numerous companies and benefits from excellent transport links. Just 2 minutes away by foot, there is a beautifully designed events venue. This new business centre offers 30 furnished office spaces over two floors of a building with views of the River Main. The offices are suitable for individuals as well as larger teams. The centre has a seating area ideal for networking or entertaining clients, high-technology audio-visual equipment, a business lounge and three meeting rooms. . The offices are available on flexible and affordable leases. Administrative support staff are provided by the centre. Located centrally in Frankfurt, this centre is very easily accessible through road links as well as public transport. This contemporary and modern business centre in Frankfurt provides a productive and refreshing workspace environment for professionals. The centre offers a range of bespoke packages including private offices, coworking spaces and meeting rooms. All workspaces include a range of facilities including 24-hour access, free beverages, printing facilities and high speed internet. The centre also offers event space that can be easily booked out. The location is highly desirable, and Frankfurt is the finance and business capital of Germany and Europe - giving you ample opportunity to network, grow and expand. There are easy links to the motorway and public transport links. This important business district, close to Frankfurt airport, offers a wide range of offices provided with all the services and facilities needed to run a successful business. Close to the airport, the main railway station and the major motorway junctions, these offices benefit of excellent connection links. It is specifically ideal for businesses with both domestic and international clients. Within the immediate area, there is a supermarket, restaurants and hotels. Bright and spacious office spaces are available to let in Frankfurt. Equipped with advanced communication systems and the latest technology, they are provided with high quality administrative services offered by a professional team. They are surrounded by shops, restaurants, bars and many other amenities and benefit from excellent transport connections. Just a short drive away, you can reach Frankfurter Golf Club, Commerzbank-Arena and Frankfurt Feldbahnmuseum. This landmark building in the bank district of Frankfurt offers luxury offices equipped with the latest technology and a wide range of services. These non-branded offices also come with IT support to keep you well connected throughout your occupancy, and state-of-the-art conference facilities so that you can convene networking sessions within an attractive space. Centrally located, this building is easily accessible and well served by public transport. Within the centre's immediate vicinity, you can find a fitness centre, restaurants and hotels. This is a unique opportunity of letting offices of various size and large meeting rooms in the heart of Frankfurt banking area. These office spaces are provided with excellent facilities and services, including high quality reception and telephone services and the latest videoconferencing facilities. Situated within walking distance of the main railway station, they are well served by public transport. This is the perfect workspace solution for companies seeking accessibility and convenience along with a great range of facilities to enable their company's success at a prime location. This impressive building consists of technologically equipped conference rooms and elegant offices, fully furnished and provided with secretarial and telephone services, virtual office and business address services and several facilities. The building enjoys a central location in Frankfurt, surrounded by numerous amenities and well served by public transport. This modern business centre is a short walk from the railway station and city centre. Parking is ample, and the site is well connected by road. Located in the centre of the financial district, this centre provides a welcoming atmosphere and professional infrastructure. In addition, the space is accessible 24/7 so you can work through late hours for as long as your require. This is the perfect workspace solution for businesses that value practicality as well as efficiency. Here, you will be well equipped to thrive under the best conditions. The business center is located in the immediate vicinity of Frankfurt Central Station. Located on the famous 'Mainzer Landstrasse' to the Frankfurt Westend, the center offers optimal location conditions in a central location. The office property is located opposite the Westend Tower in Frankfurt's preferred banking location, between the 'Platz der Republik' and the 'Alte Oper'. Close by is the Altes Polizeipräsidium, a historical landmark you can visit outside of work. Found on Mainzer Landstrasse in the very heart of Frankfurt city, this business space finds itself situated right in the centre of the business district. This modern building provides excellent virtual office options for aspiring entrepreneurs who wish to develop their business remotely and benefit from a prestigious well-known business address at an affordable rate. Your membership will also include access to meeting rooms, giving you a great space to meet face-to-face with your clients and partners. The centre also offers a range of further services which are great for startup businesses including pay roll, taxation and much more. Offering a great modern selection of co-working spaces in the heart of Frankfurt, this new building is set to open its doors in. The building offers fully equipped and fully furnished spaces, meeting room access and event space. The building provides high speed internet access, access to a terrace, kitchen and lounge area. The terms are flexible and affordable, giving you all the flexibility you need for your business. Strategically located in one of the most attractive and prestigious business areas of Frankfurt, these elegant offices offer a highly professional working environment. They benefit from a full range of high standard services and facilities, including spacious meeting rooms equipped with the latest technology, touchdown areas, service bank, 24/7 security, parking facilities and a first-class administrative support to your daily activity. The offices are easily accessible and served by numerous train, tram and bus routes. Opening soon in Sachsenhausen this business centre will be located in the South of Frankfurt and offer a range of contemporary office solutions. Whether you choose a private office, fixed desk in a collaborative space or hot desking options, all options benefit from excellent facilities. These include access to high speed internet, access to printing and copying facilities and free beverages provided by the centre. This space will provide you with a professional, friendly and productive atmosphere where you can focus on your business and develop as a professional. The location is highly central and benefits from excellent public transport links. Set in Frankfurt am Main, an ideal location for emerging and established companies, this business centre provides stunning views over the citys skyline from 12 modern offices and coworking areas. Opened in May 2017, this space offers stunning views as well as a comfortable, accommodating atmosphere within the building. WiFi and cable internet, a flat-rate for refreshments, 24/7 access as well as a daily cleaning services are included. This brand new business centre offers unique and modern coworking centre in the heart of Frankfurt. Located right beside a diverse community of businesses there is plenty of opportunity for networking and expanding your business contacts. Membership in this centre also allows you access to centre across Germany, US, UK, Netherlands, Poland and Israel. The surrounding area has plenty of amenities on offer, including hotels, restaurants, cafes and public car parking. This sought-after location features a range of support services to enhance the efficiency of your company within an attractive setting. There is 24-hour access so you can work through any hour you desire, and well-designed collaborative spaces so you can convene meetings, negotiations and training seminars. Frankfurt International Airport is less than 20 minutes away by car, and there is an abundance of local hot spots within walking distance, such as museums, art galleries, performing arts theatres, shops and eateries. These office come furnished and on flexible terms. Accessible 24 hours a day the work space is suitable for any kind of working needs! Here, you are also supported by a friendly, approachable admin team. This team can assist with greeting your clients and mail handling. The building is conveniently situated between both the metro and train station, so commuting to work is quick and easy! There are many local cafes, bars and restaurants for you to make use of on a lunch time or on a evening of socialising with clients. Frankfurt's Innenstad is a large commercial and cultural business location and the ideal location for this contemporary and modern workspace. Directly opposite Goethestrasse shopping centre members have access to fully stocked kitchens, pet-friendly areas, a games room and a fitness space. Furthermore, being in the heart of the city, you have easy access to any point of the city with fantastic transport links, including the Hauptwache and the Alte Oper S-Bahn. This turnkey solution is the perfect workspace for those that desire convenience and practicality. Offices come fully furnished and on flexible terms for your convenience. Pricing is all inclusive and comes with exclusive meeting rooms, 24-hour access, support from a friendly on-site management team and access to a VIP rooftop terrace. Frankfurt International Airport is also a 15-minute drive away for international travel. It is the ideal space for companies with both domestic and international clients. Located in the heart of Frankfurt's financial and banking district, this landmark building offers offices provided with lounge area, parking facilities and high standard services. Your business can benefit greatly from the space's administrative/IT support and reception services that will greet clients and handle all telephone answering for you. Close to the railway station, these offices are just a few minutes away from the city centre. These fantastic offices are located close to the Autobahn, the main highway in the area and various forms of public transport. Each office has a cosy lounge, and you have 24-hour access to the building. For your security and peace of mind, there is also an on-site office management team that is available. Within the immediate area, you can reach an abundance of restaurants, shops and local amenities. This new, modern and unique centre offers a flexible working space with a range of options for your workstations. Here you can have a single work station or "Waben" (honeycomb) formation which allows for larger project teams to work comfortably in a collaborative environment. The centre is location in the district of Bockheim, closely located to Frankfurt city centre. The surrounding area offers plenty of local amenities including kiosks, supermarkets and restaurants. This site benefits from an abundance of local transport links and a close proximity to a number of eateries and entertainment. The centre itself, accessible 24/7, offers its own kitchen and spaces from 150sqm upwards. Situated in the country's financial capital, your company will have lots of opportunities to network with other businesses. The entire space ensures security, with telecoms fitted throughout. Strategically located in an attractive area of Frankfurt, hosting a variety of amenities and numerous cultural attractions, these offices offer an ideal working environment for successful companies. They are provided with a full range of services and facilities, including meeting rooms, excellent internet connection and on-site café. They are served by various public transport links and are easily accessible. Situated around 4km north of Frankfurt City this modern office space benefits from being filled with light and is on one of the most important access roads in Frankfurt, part of an attractive system of office blocks, shopping and residential areas. The building offers fully furnished and well equipped private suites, with a number of exceptional facilities and amenities included on-site. The centre also provides clients with the option of virtual office packages, which offer services such as business address, telephone answering and more. Set in a historical building, designed by a famous architect, these office spaces are provided with spacious meeting rooms, the latest videoconferencing facilities, state-of-the-art technology and high quality services offered by a professional support staff. Located in a dynamic and attractive business district, they are surrounded by numerous companies and a variety of amenities. This renowned area is well served by public transport and easily accessible. Located in the heart of Frankfurt, parallel to one of the main arterial roads in Frankfurt, Mainzer Landstraße, these spaces are designed to promote productivity whether you’re a team of one or 100, as well as month-to-month flexibility. There is a choice of local parking available, many local bus stops and Frankfurt Central station is just a 10-minute walk away ensuring this is easy to commute to and from on a daily basis. 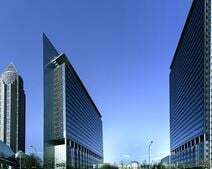 At the heart of Frankfurt's banking and business district this new office center is within a stunning landmark tower just 20 minutes from the airport. Culinary excellence will be provided by the excellent restaurant, which is located on-site. Exclusively furnished offices can be found that provide incomparable ambiance and quality. Your clients will surely be impressed by how accommodating this space is, as they will be greeted by a multilingual reception team. A stylish building, modernly designed and sophisticatedly decorated, is available to let in Frankfurt. The building consists of offices which offer an impressive working environment, technologically equipped and elegantly furnished, which will definitely enhance the image of your company. 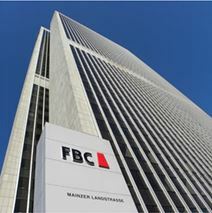 The building is excellently connected to Frankfurt airport, to the railway station and to the major motorway junctions. This centre enjoys a prominent position in the city of Frankfurt, and is seen by many motorists every day. The centre offers fully equipped office space, with a comprehensive list of services. Available on flexible terms now. This space offers catering for your convenience, as well as 24 hour access. You can use the meeting rooms, conference facilities and spacious breakout/lounge spaces. The airport is reachable by car in just 10 minutes, and the train station is just 5 minutes away. In the heart of Frankfurt City Centre and developed in cooperation with the internationally established interior designer Eric Kuster, this 29th floor serviced office centre provides incredible views of the city below. Available are a choice of single, executive and team offices as well as flexible conference rooms and a business lounge. The friendly and well educated staff is taking care of their guests and serves with secretarial service as mail handling, telephone answering, translation services and many more. This landmark building offers stylish offices, sophisticatedly designed and modernly decorated with great attention to details. Elegantly furnished and equipped with state-of-the-art technology, these offices offer a first-class working environment that will enhance the image of your company. Surrounded by bars, hotels and restaurants, this building enjoys a wonderful view over the city and the Main River. It is close to Frankfurt's main railway station and excellently served by transport links. This centre, close to lots of transport links and leisure facilities, offers modern work stations, coworking spaces and well-designed conference facilities. The space can accommodate projects of any size, from the independent to the collaborative. There is a cafe on site for easy access. There is a rooftop lounge in which you can host impressive presentations, functions and events. The building combines its historical elements with cutting-edge technology to provide a functional space with a charming atmosphere. Open in January 2017 this business centre is close to the Hauptwache subway station for convenience, in the heart of Frankfurt. Beautiful city views are available from the terrace area while tenants have a choice of fully furnished private office space or an open co-working environment. Further, the comfortable lounge as well as the kitchen offer enough space for an active networking. Whenever the weather allows it, the terrace invites you to relax and enjoy great city views and to brainstorm new ideas. Found right opposite the MyZeil shopping mall, this business centre is located between the Hauptwache and Konstablerwache in the heart of Frankfurt city. The space offers open and bright workspaces where you can work collaboratively within a network of like-minded individuals. Work stations benefit from access to meeting rooms and conferencing rooms, all of which come fully equipped with excellent service and amenities.